House of Staunton Selling S-Chess Pieces Again! The idea of adding pieces to chess is hardly new. "Chancellor chess", which introduced a rook-knight on a 9x9 board, was proposed in 1889 by Ben Foster, an American. The rook-knight (as the "Centaur") apparently dates back to 1617. The bishop-knight has a long pedigree as well, and in the 1920s Cuban World Champion Jose Raoul Capablanca proposed "Capablanca chess", adding both pieces (the "Chancellor" and the "Archbishop") on a 10x10 board. The motivation behind all the proposed reforms of chess have been the same - rather than becoming a test of skill, imagination and creativity, chess had become a matter of knowledge and technique like in casino games. Capablanca's pessimistic view that chess was "played out" some 80 years ago was shown by the subsequent development of chess to be premature and unjustified, although in retrospect Capablanca was prescient and his views were hardly deserving of the ridicule they received. The feeling that chess was played too much by rote has been shared by many players for many years. For example, Capablanca was quoted in the Charleston Gazette on February 12, 1928: "In chess today everything is known to great players. There are no new moves, no new tactics to consider. If the game is to grow it will have to be modified." To study another fascinating game, you can get a free backgammon download here, and discover how strategy plays an important role in the long run. With the advances and elaboration of opening theory and the advent of the internet, databases and chess-playing computer engines, Capablanca's intuition has been vindicated, just as it has been in so many of his games. At the highest level, new moves are seen only after 20, 25 or more theoretical moves are played, if they are seen at all. A player who knows the theory of an opening will beat a player who doesn't. Preparation and memorization count for more than skill and ability. Players no longer have to work things out, even before the game - computers will do that and the player's job is to memorize the results. Many players, especially younger players, quit chess not because they no longer enjoy playing, but because there is so much emphasis on studying and memorization that they can't afford the time to keep up with those few players who do study intensely. For kids, chess becomes too much like school, and for adults chess becomes too much like work. From being a interesting, challenging and social game, it becomes a burden. Prohibiting adjournments (so that computer analysis can't be used for ongoing games), faster time controls in tournaments (to pressure players into making mistakes) and other stopgap measures can't fully revive chess. What is needed is something new, to put players on their own resources again and allow them to experience the joy of discovering new aspects to an ancient game. Capablanca almost had it right, but the variations of chess proposed to date have had the significant drawback of requiring an expanded board. This creates several problems. From the theoretical point of view, the size of the board affects the relative value of the pieces, the most obvious example being that a larger board decreases the power of the short-range knight and king relative to the other pieces. Pawns also can't come to grips with the opposing forces as readily, and the pawn structures familiar to experienced players disappear. Conceptually, an expanded board throws out the baby with the bathwater. From the practical point of view, an expanded board means that existing boards become obsolete and have to be replaced. In addition, more pawns are needed. This makes upgrading existing sets much more cumbersome and expensive, and creates an unnecessary barrier to the acceptance of the improvement. "Seirawan chess" does not require a new set or board - only four additional pieces. 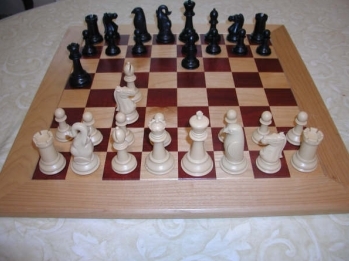 The game starts as a normal chess game. The players will not be disoriented. But the placement of the pieces on squares vacated by the existing pieces changes the game and creates innumerable possibilities which render all existing opening theory open to reexamination and opens up many new possibilities as well. Players who understand the principles of opening play will do well, while players who rely primarily on memorizing variations will find themselves in trouble. For the foreseeable future, computers won't be part of the game and human thought will once again be essential to understanding the game. We won't know all the answers, whether in the opening, middle game or endgame. Seirawan chess is played on an 8 x 8 board using all the normal rules of chess, except that two additional pieces are used. The Hawk and Elephant are not in play at the start of the game, which begins exactly as a normal chess game. Seirawan chess begins in exactly the same manner as a conventional chess game. The Hawk and the Elephant do not start the game. When a player first moves a piece from its original square, that player has the option of placing the Hawk or Elephant on the vacated square, as part of the player's move. Thus if a player played Ng1-f3, he or she could place the Hawk or Elephant on g1. The move would be recorded as 1.Nf3(Hg1). Since each side has eight pieces (K, Q, R, R, B, B, N, N), a player has eight opportunities to bring the Hawk and Elephant into play. If a player fails to do so, the unplaced piece remains out of play. 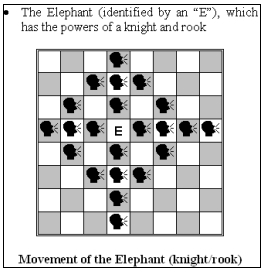 When a player castles, the Hawk or Elephant may be placed on either e1(8) or h1(8)/a1(8), but not on both. Two moves are required to bring both the Hawk and Elephant into play. 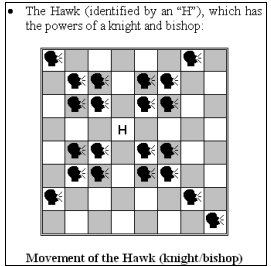 A player may promote a pawn to either a Hawk or an Elephant. The Hawk and Elephant can (and should) be used in Bughouse. As in Seirawan chess, the Hawk and Elephant start off the board and enter play when a piece is first moved from its original square. Once in play, the Hawk and Elephant are exchanged and placed in the same manner as any other piece.